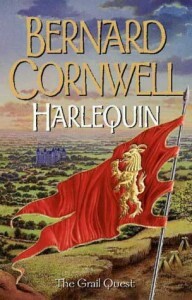 Bernard Cornwell will doubtless be best known amongst you for the best selling Sharpe series of novels – you know, the ones that Sean Bean starred in as a Napoleonic era soldier when they were adapted for TV a few years back. Following on from this great success, he has now turned his talents towards a trilogy of novels (The Grail Quest) set during the 14th century (the other two books being “Vagabond” and “Heretic”); this review is on the first of the series, “Harlequin”. You may find it surprising that I am reading these at all, given their reputation as being very much “bloke’s books”; Cornwell’s preference for writing about warfare while relishing every grisly detail of it does seem to appeal to an almost exclusively male readership, I must admit. My interest in these books, though, comes from the fact that their central character is an English longbow archer. So what? Well, having previously dabbled in archery myself, I do have something of an interest in the history of the bow, and as anyone with even a passing interest in Medieval arms will know, the 14th century is the golden era of the longbow.